Om Vishnupad Srila Bhakti Sundar Govinda Dev-Goswami Maharaj made his appearance in this world on 17 December 1929 within the holy area of Gauda-Mandal at Bamunpara, District Burdwan—only about six miles from Sripat Hapaniya where Srila Bhakti Raksak Sridhar Dev-Goswami Maharaj made his advent. Srila Govinda Maharaj came to the lotus feet of Srila Sridhar Maharaj at the young age of seventeen years. From the beginning Srila Sridhar Maharaj revealed his desire that Srila Govinda Maharaj would occupy the position of his successor in the future, and he quickly entrusted Srila Govinda Maharaj with full responsibility of the Math’s running. Srila Govinda Maharaj’s natural talent, coupled with his fine delivery of Hari-katha [holy talks of the Supreme Lord and His Pastimes], and, on the practical side of devotional life, his untiring services in upholding the Mission of Sri Chaitanya Saraswat Math (it was none other than he who designed and supervised the building of the Math) ever ful­filled the desires of his Gurudev. 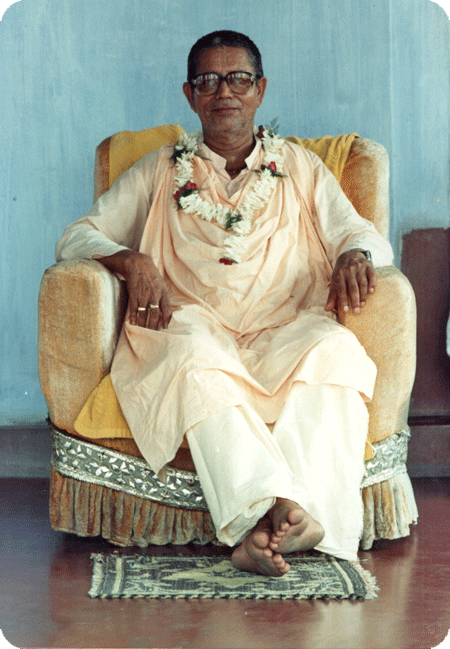 Srila Sridhar Maharaj and Srila Govinda Maharaj had a uniquely intimate Guru-disciple relationship, and Srila Sridhar Maharaj had the highest regard for his beloved disciple. About Srila Govinda Maharaj, Srila Sridhar Maharaj commented: “Above all, he is well-known and unanimously acclaimed as being firmly established in the philosophy of the perfect axiomatic truth of bhakti as propounded by both myself as well as by my Divine Master.” On another occasion Srila Sridhar Maharaj described Srila Govinda Maharaj as a “natural paramahamsa”, and even went so far as to state, “Actually in many ways he is more qualified than I am.” Srila Sridhar Maharaj also expressed that he found Srila Bhakti Siddhanta Saraswati Thakur’s mood in Srila Govinda Maharaj, even more than in most of his godbrothers, who had had his extensive association. Fulfilling a wish he had cherished for about forty years, Srila Sridhar Maharaj conferred sannyas upon Srila Govinda Maharaj in 1985, and in 1986 gave his final and irrevocable decision of his selection of Srila Govinda Maharaj as successor President-Acharya of Sri Chaitanya Saraswat Math of Nabadwip, with all of its branches in India and worldwide. As President-Acharya of Sri Chaitanya Saraswat Math, Srila Govinda Maharaj completed twenty-four world tours. Srila Govinda Maharaj gave spiritual inspiration to persons from all walks of life, and again and again showed his perfect ability to connect all persons, all things, and all circumstances with the service of the Lord. Srila Govinda Maharaj had extreme affection for the fallen souls, and through his magnanimous dealings attracted the hearts of thousands to the banner of Sri Chaitanya Mahaprabhu. In his preaching, as well as his practice, Srila Govinda Maharaj emphasised Mahaprabhu’s teaching that one must serve the Lord with humility, tolerance, and respect for all. Highly learned in Sanskrit and Bengali, Srila Govinda Maharaj has, as did his illustrious Gurudev, given us many divine prayers and songs for the cultivation of our spiritual life. His discourses, renowned for their clarity, practicality, and heart-touching charm, are also continuously being published in book form for the nourishment of sincere seekers and practitioners alike. Under the guidance of Srila Govinda Maharaj, over 100 centres of Sri Chaitanya Saraswat Math have opened worldwide and more than 350 publications in over twenty languages propagating the message of Sri Chaitanya Mahaprabhu have been published. Srila Govinda Maharaj left the world in March 2010, and before leaving established Srila Bhakti Nirmal Acharya Maharaj as Successor Sevaite-President-Acharya of Sri Chaitanya Saraswat Math. A Brief Autobiography: “Bound by Affection” His Divine Grace Srila Bhakti Sundar Govinda Dev-Goswami Maharaj reflects on the events that surrounded his first days at Sri Chaitanya Saraswat Math at the lotus feet of His Divine Master, Srila Bhakti Raksak Sridhar Dev-Goswami Maharaj. This talk, Bound by Affection, was given 50 years after the event, here at the Math.